Official Address of PRC or Professional Regulation Commission is P. Paredes., Cor. 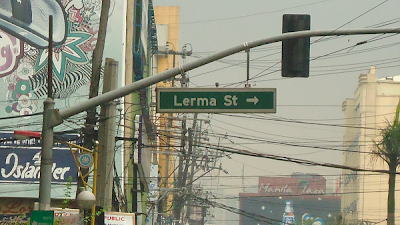 Morayta St., Sampaloc, Manila. PRC website is prc.gov.ph. If you want to get PRC renewal form, you might need to check their website first. This post is PRC commuters guide. The only familiar street in PRC address is Morayta. 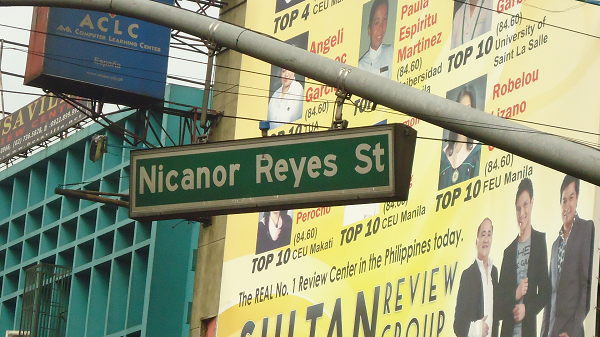 Officially, Morayta is now Nicanor Reyes Street. But the exact location of PRC is only approximately 50 meters from Espana Boulevard, the main thoroughfare in Manila where most of public buses and jeepneys from far distant locations in Metro Manila pass through. From Alabang, Pacita, Metropolis Starmall, Filinvest City, Festival Mall, Sucat, Bicutan, nearby areas, and Southern Tagalog provinces of Batangas, Laguna and Quezon. Ride a bus or FX with "Lawton" or "Santa Cruz" sign. Get off at Lawton. In Lawton, ride a jeep with any of these signs: "Quiapo Espana", "Cubao Espana", "Project 6", "Project 2-3" and "Fairview". You can ride a jeepney going to these routes along the road that borders Metropolitan Theater or the road near to Park and Ride Lawton. Ask the driver to drop you off at Morayta now known as Nicaror Reyes. 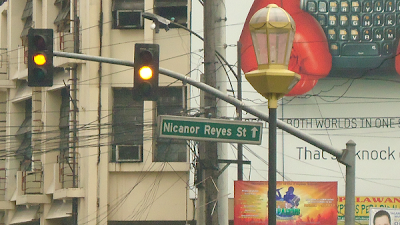 Nicanor Reyes aka Morayta is the first junction with traffic lights after the jeepney passes through Quezon Avenue Lerma Underpass. Landmarks here are: Chowking, Mang Inasal and Greenwich Pizza. See the map below. The first red placemark is where you get off. From there, follow the red line and walk on Morayta which is now Nicanor Reyes Street. Turn left immediately on the street that borders Greenwich Pizza. That street is P. Paredes Street. As you can see in the map, PRC is to the left of Paredes, just a few meters from the corner of Morayta and Paredes. Tip: You're using mobile. Touch the map with TWO fingers and drag it downward to see the first placemark or pin (red.) Pinch the map 2 to 4 times until you can see LRT Recto. 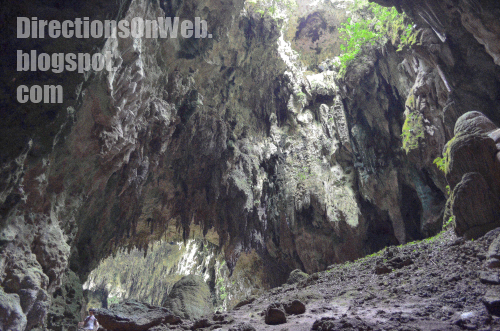 At that zoom level, you'll get an idea about the location. Drag the map anywhere you want. Zoom in again by 'pinch-out' gesture. From Cavite, Tagaytay, Bacoor, Dasmarinas, Imus, Emilio Aguinaldo Highway, Las Pinas, SM Southmall, Alabang Zapote Road and areas near to these locations. Ride a bus or FX going to Lawton or Santa Cruz Manila. Get off at Lawton and follow the direction given in Route #1. From Pasay, Paranaque, Baclaran, Pasay Rotonda, Libertad, Gil Puyat or Buendia and nearby areas. Ride a train going to Monumento/Roosevelt in any LRT-1 station near to you. Depending on your location in these areas, you can go to any of these stations: Baclaran Station, EDSA Station, Libertad Station, Gil Puyat Station and Vito Cruz Station. Get off at U.N. Avenue Station. Ride a jeepney with any of these signs: "Quiapo Espana", "Cubao Espana", "Project 6", "Project 2-3" and "Fairview". You can ride a jeepney going to these routes along Taft Avenue near corner U.N. Avenue just after you descend from U.N. Station. Ask the driver to drop you off at Morayta now known as Nicanor Reyes. Nicanor Reyes aka Morayta is the first junction with traffic lights after the jeepney passes through Quezon Avenue Lerma Underpass. Please see photos at Route #1. Landmarks here are: Chowking, Mang Inasal and Greenwich Pizza. See the map below. The first red placemark is where you get off. From there, follow the red line and walk on Morayta which is now Nicanor Reyes Street. Turn left immediately on the street that borders Greenwich Pizza. That street is P. Paredes Street. As you can see in the map, PRC is to the left of Paredes, just a few meters from the corner of Paredes and Nicanor Reyes aka Morayta. Alternatively, you can get to PRC from any point along Taft Avenue in just one ride only. But taking into consideration the traffic along Taft, the best way is by LRT. If you really want to get to PRC by one ride only, you can take a jeepney with "Cubao Quiapo" or "Fairview Quiapo" sign and get off at Nicanor Reyes formerly Morayta Street. If you're not familiar with these locations, please ask driver to drop you off at Morayta. From Cubao, Araneta Center, Gateway Mall, Project 4 and nearby areas. Option 1 - Ride an LRT-2 train bound for Recto, the last station in the other end. You can take a train in Araneta Center Cubao Station. Important: Make sure you're in LRT-2 and not in MRT-3 as both lines have the same names of their stations. To avoid confusion, remember that MRT-3 is in EDSA while LRT-2 is in Aurora Blvd, and LRT-2 Araneta Center Cubao Station is connected to Gateway Mall. This direction is also the best route to take if your point of origin is along the path of LRT-2, e.g. Santolan, Katipunan, Anonas, Betty Go Belmonte, Gimore, V. Mapa, Pureza, etc. Get off the train at Recto Station. Get out of the station through the exit to the left side which is alongside the big Isetann mall. Below the station, along Recto Avenue, just in front of Recto Station entrance, ride a jeepney with any of these signs: "Morayta", "Nicanor Reyes" or "PRC". Pay minimum. The jeepney will take Recto Avenue and then it will turn left on Nicanor Reyes formorly Morayta. Get off the jeepney at Paredes Street, the last road to the right of Nicanor Reyes before Espana. Walk along Paredes street until you get to the gate of PRC, to the left of Paredes Street. It's very near, almost at the corner of Nicanor Reyes and Paredes Street. Option 2 - In Aurora Boulevard where Araneta Center Station and Anonas Station of LRT-2 are located, ride a jeepney with "Quiapo" sign. If you're from area near Anonas Station like Project 4, you need to get to the part of Aurora Boulevard near Araneta Center Cubao Station of LRT-2 because the jeepneys going to Quiapo only pass through here. Ask the driver to drop you off at Morayta now known as Nicanor Reyes. Before you get to Nicanor Reyes aka Morayta, the jeep will pass through Welcome Rotonda, UST or University of Santo Tomas and more intersections in between. Next to UST is P. Noval Street, followed by Eloisa, Tolentino and Adelina streets. Next to Adelina is P. Campa. There's Mcdonald's between Adelina and P. Campa. Get off at unloading Station or "Babaan" in front of Mcdonald's. In the opposite corner of P. Campa is KFC. There's also a pedestrian overpass next to KFC. Go across Espana via this pedestrian overpass towards the opposite side where Mang Inasal, Chowking and Greenwich are located. Photos below are taken from underneath the pedestrian overpass towards the direction of Nicanor Reyes aka Morayta. See the map below, follow the red line and walk towards the location of PRC. The first red placemark is where you get off, in front of McDonald's. Then you walk towards pedestrian overpass and go across Espana. Following the red line, you will pass by Chowking, Mang Inasal ang then Greenwich Pizza. Turn left on the street that borders Greenwich which is Paredes. As you can see PRC is to the left of Paredes Street. From Marikina, Antipolo, Pasig near Santolan, Santa Lucia, Katipunan, Ateneo de Manila and areas near to these locations. Go to either Santolan Station or Katipunan Station of LRT-2. Ride a train there going to Recto. Get off at Recto Station, the last Station. Exit Recto Station to the left of the Station. 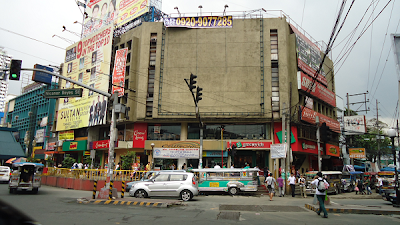 Along Recto Avenue where Isetann Mall is located at the corner of Evangelista and Recto. Wait for a jeepney with "Morayta" or "Gastambide" sign. Ride one of these jeepneys, pay minumum. No need to ask the driver to drop you off at your destination if the sign of jeepney you ride is Morayta because its terminal is exactly located at the corner of Nicanor Reyes aka Morayta and Paredes Street where PRC is located. Just walk along Paredes and soon you will see PRC to the left. If the sign of the jeepney you ride is Gastambide then ask the driver to drop you off at PRC. From Pampanga, Bulacan, Novaliches, Balintawak, Bagong Barrio and nearby areas. Ride a bus, a jeep or FX bound to Manila via NLEX and get off at Balintawak. Walk towards Balintawak Station of LRT-1 and ride a train going to Baclaran. Get off at Doroteo Jose Station. From Doroteo Jose, walk along Avenida towards Recto Avenue which is next to Doroteo Jose Street. Go across Recto and ride a jeepney with "Morayta" or "Gastambide" sign. Ride one of these jeepneys, pay minumum. No need to ask the driver to drop you off at your destination if the sign of jeepney you ride is Morayta because its terminal is exactly located at the corner of Nicanor Reyes aka Morayta and Paredes Street where PRC is located. Just walk along Paredes and soon you will see PRC to the left. If the sign of the jeepney you ride is Gastambide then ask the driver to drop you off at PRC. From Caloocan, Malabon, Navotas, Valenzuela and nearby areas. Go to Monumento and ride a train going to Baclaran. You can also ride a train in 5th Avenue Station, R. Papa Station, Jose Abad Santos Station or any station of LRT-1 near to your location. Get off at Doroteo Jose Station and follow direction given in Route #6. From Fairview, U.P. Diliman, Commonwealth, U.P. Ayala Technohub, Philcoa, Quezon City Hall, Quezon Avenue, Centris, Project 6, Munoz, SM North EDSA, Trinoma, West Avenue, Project 2 and 3, Kamias, Kamuning and other areas near to these vicinities. Ride a jeepney going to any destination but must have a "Quiapo" and "Espana" words on its sign. Ask the driver to drop you off at Morayta. Here's the guide to make sure you don't go beyond your destination. Before Morayta, the jeep will pass through Welcome Rotonda, UST or University of Santo Tomas and more intersections in between. Next to UST is P. Noval Street, followed by Eloisa, Tolentino and Adelina streets. Next to Adelina is P. Campa. There's Mcdonald's between Adelina and P. Campa. Get off at unloading Station or "Babaan" in front of Mcdonald's. In the opposite corner of P. Campa is KFC. There's also a pedestrian overpass next to KFC. Go across Espana via this overpass towards the opposite side where Chowking, Mang Inasal and Greenwich are located. From Pasig Pinagbuhatan, Pasig Kapitolyo, Pasig Palengke, EDSA Shaw, Shangri-La Plaza, Starmall, Mandaluyong and nearby areas. Ride a jeepney with "Quiapo" sign. Get off at Legarda. Ride another jeepney with "Divisoria" sign. Get off at Morayta. If you're not familiar with these places, please ask the driver to drop you off. 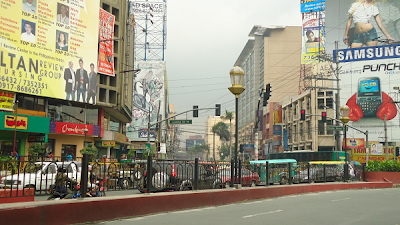 At the corner of Morayta and Recto Avenue, you have the option to wait for a jeepney from Divisoria going to Morayta and PRC or, from that corner, you can walk towards the opposite end of Morayta. 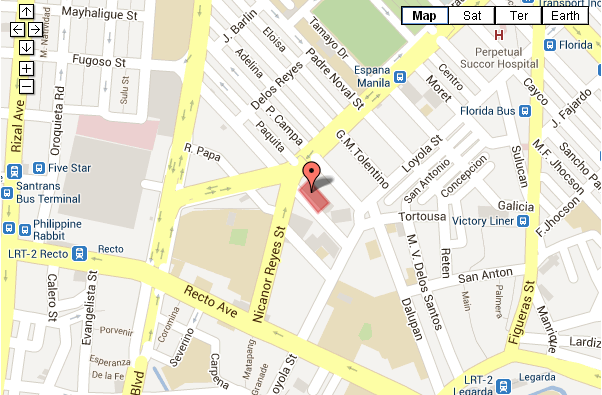 It's just approximately 320 meters from corner of Recto and Morayta up to Paredes Street. You will cross R. Papa Street before you get to Paredes Street. In Paredes Street, walk towards the opposite end. 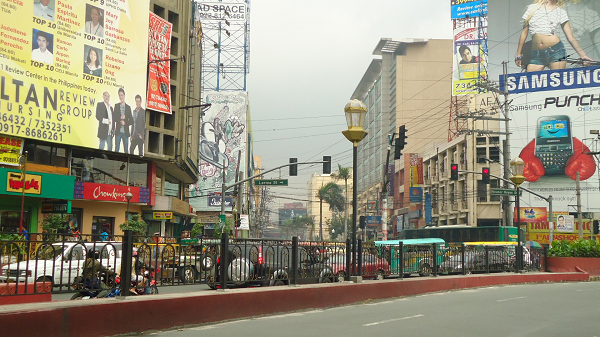 But just few meters from the corner of Nicanor Reyes aka Morayta and Paredes, you will see the PRC building to the left. Now that you know how to get to Professional Regulation Commission, don't forget to check their website first before you get down there. PRC renewal form might be easily obtained by reading appropriate section there. The PRC Website is already given at the start of this post, just in case you forgot. Note: You can zoom in by using 'pinch-out' gesture. detailed routes. Thank you so much! @ ana banana. You are welcome. @ Airam Azzir. Just ride a jeepney bound for Divisoria with its terminal located at the corner of Nicanor Reyes aka Morayta and Paredes St. Alight at Avenida Ave where LRT-1 passes through. Ride a jeepney with "Baclaran Taft" which takes the whole stretch of Taft Ave. Get off the jeep at your destination. wow..nkita ko na pla ang lugar na to before, but di ko lng alam kung saang parte ang PRC.. thanks for the detailed routes..di na ako maliligaw..thnx. hw about frm prc to novaliches??hellp,pls.. @ LadyLane Escobar. Bus to Quezon Av, then follow route. wow! surely very helpful. thank you much!!! You're welcome... have a great day. is there alternating route from makati?